Anyonewho enjoys watching the sky for "shooting stars" will have anopportunity to observe an old and reliable meteor display over the next severaldays: the April Lyrids. The best time to watch will be for a night or twoaround the peak, April 22. Thesemeteors are among the oldest known, with ancient records of them dating backnearly 27 centuries. ?The Lyrid meteor shower is also the first significantmeteor shower to appear since the beginning of the year. While it won't producea storm of meteors, it's a respectable show for those who are patient. "Theannual Lyrid shower . . . has always been my favorite," says NASA meteorexpert Peter Jenniskens. "After the low (meteor) rates in the cold monthsof February and March, this shower is the proverbial swallow of spring forobservers in the northern hemisphere."? Andin addition to the Lyrids, there is also a small chance to get a glimpse ofsome dazzling fireball meteors from a completely different meteor swarm. ?Although probably much more erratic and far less reliable than the Lyrids, it'sstill worth looking for; one could call it a "wild card" for meteorobservers. TheLyrids are an annual display of fairly fast meteors that may be seen any nightfrom April 16 to 25: they are above one-half of their maximum in numbers forabout a day or two centered on the date of their peak activity. Thisyear, the peak is predicted to fall during the daylight hours (for America andEurope) on April 22. After the gibbous moon sets at about 2:30 a.m. localdaylight time that morning, observers near latitude 40 degrees north will stillhave about 90 minutes of dark sky to watch for the Lyrids before dawninterferes. The southern states are more favored because the Moon sets earlierand twilight begins later.? Asingle observer may count anywhere from 10 to 20 meteors per hour. 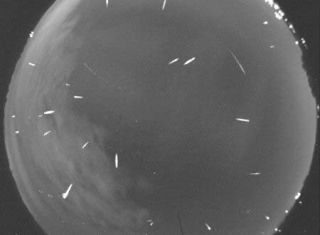 NormanMcLeod, a veteran observer of the American Meteor Society, has described theLyrids as rich in faint meteors, but with some occasional bright ones.? Britishmeteor expert Alastair McBeath, in the 2010 Astronomical Calendar notes thatthe Lyrids are capable of producing meteors that are "spectacularlybright, with approximately 20-25-percent leaving persistent trains."? Watchingfor meteors is easy. Find a dark place away from lights as much as possible.The predawn hours are best, because that's when the part of Earth you'restanding on is facing the oncoming stream of debris — mostly sand-grain-sizedparticles — that make the meteor shower. Lieback, look up, and scan as much of the sky as possible. The meteors couldappear anywhere. Give your eyes at least 15 minutes to adjust to the darkness. Youcan distinguish a Lyrid from any other meteors seen around the same time bynoting that its trail points back to near the dazzling blue-white star Vega. You'll see this star sitting just above the northeast horizon around 10 p.m.local daylight time; by around 1:30 a.m. it will have climbed to a point morethan halfway up in the eastern sky. ?Actually the radiant or emanation pointfor these meteors is just to the southwest of Vega, on the border betweenVega's little constellation of Lyra (hence the name "Lyrids") andthe dim, sprawling constellation of Hercules. TheLyrid radiant is at its highest (right overhead for the southern states and notfar off it for anyone at mid-northern latitudes) about the time that dawnbegins to break. TheLyrids are following in the orbit of Comet Thatcher, which swung past us in1861 and is not expected to return until around the year 2276.? Thereare a number of historic records of meteor displays believed to be Lyrids,notably in 687 B.C. and 15 B.C. in China, and A.D. 1136 in Korea when"many stars flew from the northeast." On April 20, 1803, numeroustownspeople in Richmond, Virginia, were roused from their beds by a fire alarmand were able to observe a very rich display between 1 and 3 o'clock.? Themeteors "seemed to fall from every point in the heavens, in such numbersas to resemble a shower of skyrockets."? The rate was estimated at 700 perhour! In1922, an unexpected Lyrid hourly rate of 96 was recorded. In 1945, a Japaneseobserver counted 112 meteors (most of them Lyrids) in only 67 minutes, while in1982 several observers based in Florida and Colorado saw 90 to 100 Lyrids perhour. So it seems that sometimes there can be unexpected surprises with theLyrids, although calculations by some meteor scientists suggest that the nextoutburst of activity isn't due until perhaps the year 2040. Overthe years, during the last half of April, irregular numbers of very brightmeteors have been seen coming from the southern part of the sky. Thesefireballs sometimes drop as meteorites, and possibly they might be the remnantsfrom a broken-up asteroid instead of a comet. Suchspeculation dates back to the 1960's thanks to the similarity between thecalculated orbits of a shadow-casting fireball that passed over northern NewJersey on April 23, 1962 and a bolide (exploding meteor) which droppedmeteorites over England, Wales and northern Ireland on April 25, 1969. Meteorastronomer, the late Charles P. Olivier utilized 80 observations to compute anorbit for the 1962 fireball, while British workers used a computer at theUniversity of Liverpool to analyze over 300 sightings of the 1969 bolide. ?Theresult showed that both objects have remarkably similar orbits.? Their radiantappears to be very near to the constellation of Corvus, the Crow, a littlefour-sided figure of fairly bright stars, like a triangle whose top has beenremoved by a slanting cut. You can readily identify it this week by facing duesouth around 11 p.m. local daylight time.?? Usingthe observations of the 1962 and 1969 fireballs, I've determined that a"window of opportunity" for possibly making another fireball sightingwould come between 11 a.m. Eastern Daylight Time on April 23 through 2 p.m. EDTon April 25.?So across North America, the nights of April 23 and April 24offer the most promise. ?Prior to midnight, potential candidates would appearto streak out from the south-southeast part of the sky, while after midnightthey would appear to come from the south-southwest.? Backin the June 1970 Journal of the British Astronomical Asociation, Keith B.Hindley and Howard G. Miles suggested that: "The period April 23-26 should be covered in the future by amateur and professional groups in the hopeof recording further associated fireballs and perhaps meteorite falls." JoeRao serves as an instructor and guest lecturer at New York's HaydenPlanetarium. He writes about astronomy for The New York Times and otherpublications, and he is also an on-camera meteorologist for News 12 Westchester,New York.